Track calories, drop pounds, and keep the weight off by using the completely revised and updated The Calorie Counter, 6th Edition—the only calorie counter and weight-loss guide written by experts in nutrition and science. Diet trends may come and go, but one thing is certain—calories count! 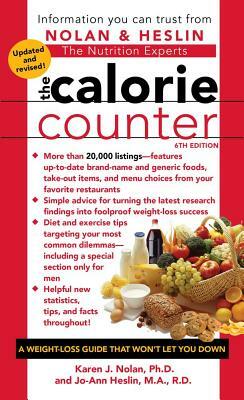 The Calorie Counter, 6th Edition, is the only book you will ever need to lose weight and keep it off. This handy guide includes: up-to-date calorie counts for more than 20,000 foods, including thousands of brand-name and generic items, more than 900 take-out options, and menu choices from 110-plus national and regional restaurant chains; solutions for real-life dieting dilemmas; advice for avoiding dieting myths and land mines that can sabotage your success; easy mealtime tips that put you in charge of your eating habits; simple tricks for burning more calories daily without a formal exercise program; weight-loss tips specifically for men; and much, much more!